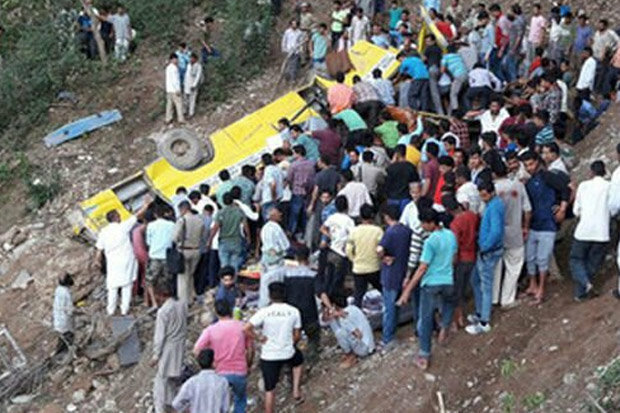 A bus crash in India has killed 23 children and 4 adults. The bus fell into a gorge after it plunged off a mountain road in Nurpur, of the northern Indian state of Himachal Pradesh. This occurred on Monday, April 9, 2018 while it was dropping the students home after school. The death toll is expected to rise as 20 bodies have been recovered by the authorities and volunteers but the death toll is expected to rise. SDM Nurpur Abid Hussain said. “It was expected that more bodies would be recovered; those injured were sent to nearby hospitals.” Recovery operations are still under way. The children were students of a private school in Nurpur town, 300km from the capital state, Shimla. The exact number of students in the bus is expected to be around 40. India has the world’s deadliest roads, with almost 150,000 people killed in accidents in 2015.